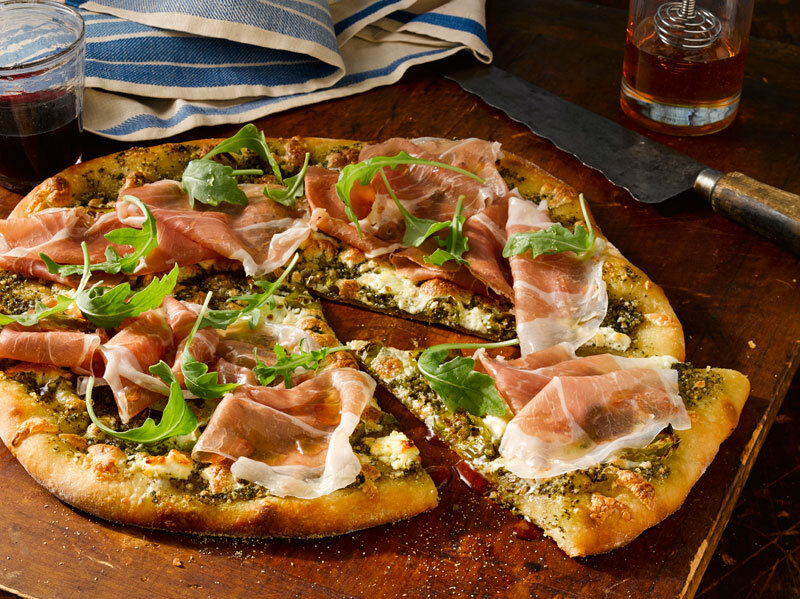 This refreshing and delicious California Arugula Prosciutto Pizza is perfect for summer. The mixture of flavors brought forth by the goat cheese, mozzarella and Prosciutto gives the arugula prosciutto pizza a traditional Mediterranean taste while the walnuts add a surprising crunch. Mix in a little sweetness by drizzling just a touch of honey, which pairs wonderfully with the saltiness from the rest of the ingredients. The freshness of the California-style arugula Prosciutto pizza is an easy meal the whole family will love or entertaining special guests. Add ice water to a medium bowl, set aside. In a medium pot, bring some water to a boil. Add garlic cloves and 1 cup of wild arugula. After 30 seconds, drain and immediately add to ice water to stop cooking. When cool, remove arugula and garlic and, using paper towels, squeeze out excess water. In a blender puree cooked arugula, garlic cloves, walnuts, extra-virgin olive oil, and a pinch of sea salt. Set aside. Roll out the pizza dough until it is about 12 inches across. Spread a heaping tablespoon or two of the pesto over the pizza dough. Distribute mozzarella and goat cheese over the pesto. Add the sliced peppers and sprinkle a pinch of sea salt. Bake pizza for 15 to 25 minutes, until cheese is melted and crust is golden brown and bubbling. Remove pizza from oven, drizzle the thinned honey over the pizza and top with remaining 1/4 cup of arugula. Slice pizza into six slices and lay a piece or two of Prosciutto di Parma on each slice. Serve immediately.